More than one-fifth of the money paid to veterans by the federal government for prescribed drugs in the fiscal year 2015-16 went toward medical cannabis. The data, obtained by CBC News through an Access to Information request, shows the effect medical marijuana payments are having on the drug reimbursement budget of Veterans Affairs Canada. More than one-fifth of the money paid to veterans by the federal government for prescribed drugs in the fiscal year 2015-16 went toward medical cannabis. That's up from just 0.5 per cent in 2013-14. The data, obtained by CBC News through an Access to Information request, shows the effect medical marijuana payments are having on the drug reimbursement budget of Veterans Affairs Canada. In 2015-16, veterans were reimbursed $91,557,485 for all prescribed drugs. Of that, $20,538,153 went toward medical marijuana. The dollar value of marijuana payments to veterans have increased more than 50-fold in the past two years. 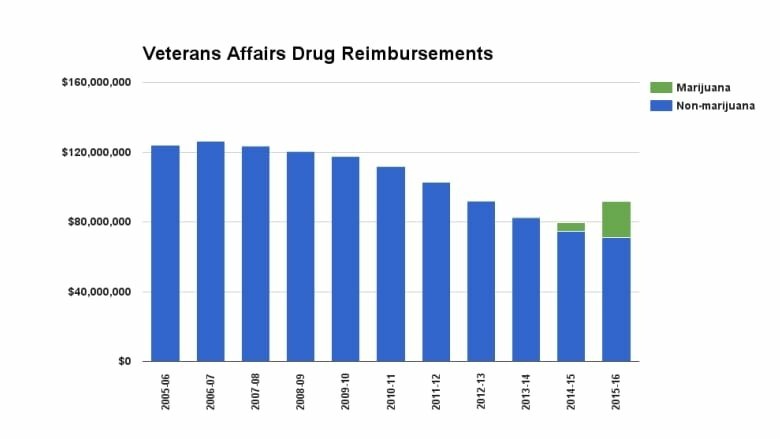 The number of veterans being reimbursed for drugs has dropped every year for the past decade, but last year the total drug budget at Veterans Affairs increased for the first time in nine years. The average amount paid to veterans claiming for drugs had remained relatively steady until the sharp rise in marijuana payments. (Redmond Shannon/CBC)Earlier this month, Canada's Auditor General Michael Ferguson urged the Department of Veterans Affairs to get a handle on its drugs benefit program, including the amount of medical pot being prescribed to veterans, which it found is "poorly documented" and not always based on evidence. "I believe that government departments and organizations urgently need to turn their attention to this issue. They need to focus on collecting the right data to support their activities," Ferguson said on May 3. 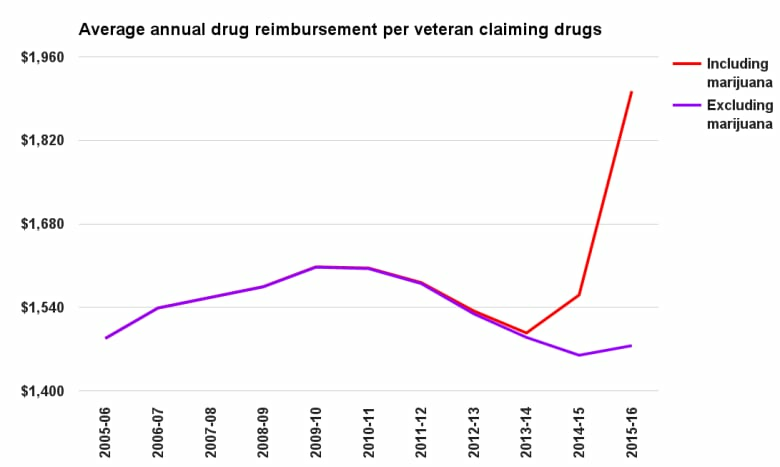 The records from Veterans Affairs show between 2005-06 and 2014-15, the average annual drug reimbursement for a veteran claiming for drugs stayed relatively steady, ranging from $1,488 to $1,608 per veteran. However, in 2015-16 — when marijuana payments became more significant — that average reimbursement figure jumped to $1,902. In 2014, the department limited to 10 grams per day the amount of medical marijuana it would cover for eligible veterans, but the auditor general's office could not find any evidence to support this decision. In April, Health Canada published updated guidelines on cannabis dosage. The document quotes various studies, which suggest smoking or ingesting no more than 3.2 grams per day. 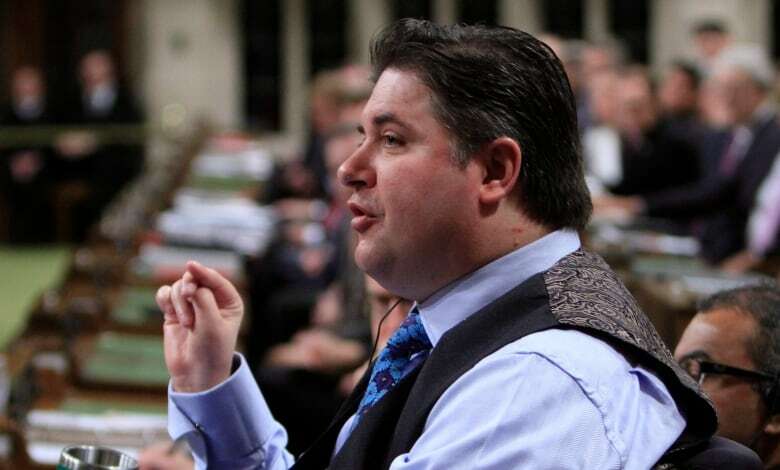 Veterans Affairs Minster Kent Hehr launched a review in March of the process by which veterans are reimbursed for medical cannabis. The data from Veterans Affairs also show that the number of veterans being reimbursed for medical marijuana has risen from 112 to 1,762 in the past two years; a more than 15-fold increase. Of the 1,762 veterans, only one was reimbursed for marijuana alone. The other 1,761 were reimbursed for marijuana and at least one other prescribed drug. Kyle Atkinson is president of Trauma Healing Centers — a company that helps veterans file reimbursement claims for medicinal marijuana. He suspects some of the veterans using cannabis may have stopped using other prescription drugs, but he says they can still claim for over-the-counter medications related to their pensionable condition. "A lot of the veterans that are on these medications for PTSD (post traumatic stress disorder) and chronic pain and other conditions, the veterans are coming off of a lot of medications as well," said Atkinson. "Medical marijuana is not inexpensive, I will certainly say that. It's one of the more expensive medications out there." Veterans Affairs Canada told CBC News that over-the-counter medications are eligible for reimbursement, but only if they are prescribed by a physician. Atkinson insists the benefits of increased spending on medical marijuana can't be easily measured. "When you add the increase in quality of life, it's really hard to measure and put a dollar amount on," said Atkinson. "The cost benefit analysis that's done there is in favour of the veteran that's on cannabis."